As we age, our spinal canal narrows and causes an array of issues with the vertebrae, discs, and the central nervous system, which may result in a condition known as spinal stenosis. But, what is spinal stenosis? It is a condition where the spinal canal narrows and causes compression on the nerve roots within the spinal cord, which may cause symptoms to arise such as pain, weakness, and numbness throughout the body. We will look at the various stenosis types and causes so you will know which spinal stenosis treatment may best work for you if you suffer from this condition. Spinal stenosis affects walking and balance, and because it can occur anywhere along the spine, sensations may also be affected. This is because our spine consists of bones known as vertebrae, where part of the central nervous system runs directly through from our brain to the rest of the body. Any damage or trauma to the bones and tissue protecting these nerves can have a debilitating effect on our physical functioning. There are three main types of spinal stenosis. This type of stenosis concerns the seven vertebrae that form the cervical spine between the skull and the chest. This region is also referred to as the C-spine. This region consists of the next 12 vertebrae along the middle of the back. Physical actions like rotation and side-to-side movements result from this area of the spine. The next five vertebrae between the rib cage and the pelvis contain the lumbar region. This lower back area supports the body’s weight and allows us to bend and twist. We mentioned how the natural aging process could have a profound effect on the narrowing of the spinal canal. This narrowing can also be initiated or heightened with other external and internal factors. For example, a smaller than normal spinal cord or medical conditions such as scoliosis will result in spinal stenosis, as well as the following conditions. Arthritis is one of the leading causes of spinal stenosis. This inflammation of the joints causes the cartilage to collapse. Osteoarthritis is a condition that results in compression of the nerves with the development of bone spurs and expansion of ligaments. Congenital disabilities that affect the spine can cause spinal stenosis. These bone spurs can be the result of Paget’s disease. This disease causes pressure on the spinal canal. This condition can cause spinal stenosis as any trauma to these cushioning discs of the spine can lead to extra pressure on the spinal canal. The expansion of ligaments due to injury, disease, or the natural aging process can place pressure on the nerves of the spine. Ligaments connect the bones of the spine. Tumors growing within the spinal canal are abnormal and may be cancerous. They may appear between the vertebrae and spinal cord, or possibly throughout the cord’s membrane covering. Injuries to the spine can directly or indirectly cause spinal stenosis. A broken bone fragment or inflamed tissues in the spinal canal can cause compression on the nerves. With any mild symptoms, your doctor may take a wait-and-watch approach with frequent monitoring using diagnostic tests. There are devices that can help with movements such as canes, walkers, or braces. For symptoms that do not dissipate or are severe, the physician may treat them with medication, physical therapy, or surgery. Over-the-counter and prescribed pain relievers such as acetaminophen, ibuprofen, and naproxen may be required for short-term use to settle the pain. Also, some cases require daily anti-depressant treatments such as amitriptyline. Another short-term treatment may be opioid drugs such as oxycodone and hydrocodone. And, the use of anti-seizure drugs such as gabapentin and pregabalin target nerve pain. Steroid injections target inflammation and are used sparingly as a possible side effect is bone weakness. This form of therapy concentrates on strengthening weak muscles, as well as improving flexibility and balance. Surgical procedures to relieve pressure on the spine can involve a decompression procedure to remove part of the expanded ligament. Removal surgeries may include a laminectomy, laminotomy, or laminoplasty. Current research and clinical trials are concentrating on using stem cells for spinal diseases. Outside of the hospital setting, there are therapies that may alleviate the pain and suffering caused by spinal stenosis. These include massage and chiropractic treatments, as well as acupuncture. Also, you may want to try the following to help with your condition. We may not be able to stop the aging process, but we can take steps to prevent other causes of spinal stenosis. The harsh chemicals in tobacco products weaken the discs and reduce bone density, which can cause the spinal canal to shrink. Maintain a healthy weight based on your body frame, as the spine helps to support your body weight. Enhance your flexibility by stretching every day. Doing this will strengthen the ligaments and prevent them from deteriorating, as well as improve disc function. Exercises such as leg and back stretches, quadricep stretches, hip flexor stretches, and knee-to-chest stretches will all help to prevent spinal stenosis. Spinal stenosis is a debilitating disease that affects any part of the spinal column. The painful symptoms can vary from mild to severe depending on the location of the trauma or damage along the spine. In addition to the natural aging process, spinal stenosis can also be the result of any injury or illness on the part of the spine causing compression of the nerve roots. 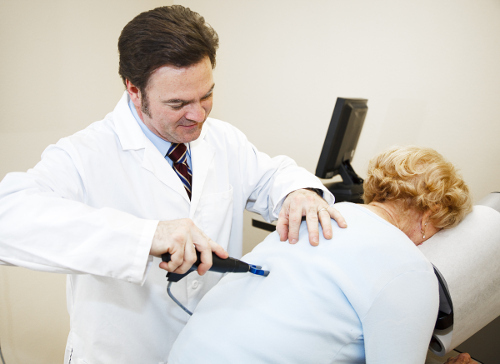 Treatment can range from exercises to more drastic measures such as surgical removal of damaged parts of the spine. By staying fit and living a clean lifestyle, you can reduce the risk of developing spinal stenosis. “What Is Spinal Stenosis?” WebMD, October 17, 2016; http://www.webmd.com/back-pain/guide/spinal-stenosis#1-2, last accessed July 17, 2017. “Spinal Stenosis,” Mayo Clinic, June 30, 2017; http://www.mayoclinic.org/diseases-conditions/spinal-stenosis/home/ovc-20320403, last accessed July 17, 2017. Jr., Ulrich, P.F., “Lumbar Spinal Stenosis: A Definitive Guide,” Spine Health, May 10, 2011; https://www.spine-health.com/conditions/spinal-stenosis/lumbar-spinal-stenosis-a-definitive-guide, last accessed July 17, 2017. “Cervical Spinal Stenosis – Topic Overview,” WebMD; http://www.webmd.com/back-pain/tc/cervical-spinal-stenosis-topic-overview#1, last accessed July 17, 2017. “Spinal Stenosis,” Mayfield Brain & Spine, April 2016; https://www.mayfieldclinic.com/PE-STEN.htm, last accessed July 17, 2017.